I discovered The Origin of Financial Crises via the Economist and it took a few months to get it from Amazon (I'm guessing they didn't expect the demand, if you pardon the pun), but I'm really glad I jumped through all the hoops to get it. 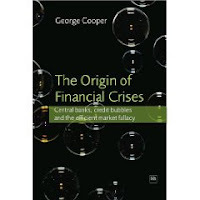 It is the most well written macro econ text I've ever read and puts forth a novel (to me) explanation of the root cause of financial crises in general, and suggests they've been increasing in magnitude, yikes! Below are chapter notes I jotted down, I highly recommend that anyone interested in the current economic mess get this book. Economic policy is lopsided, laissez-faire in the good times when the markets are booming and socialist when things go bad. Efficient Market Hypothesis: asset prices are always and everywhere at the correct price. Leaves no room for asset price bubbles or busts. Distributions do not fit the reality of the markets. Better theory? Financial Instability Hypothesis developed by Minsky (influence from Keynes). Argues that financial markets are driven by waves of credit expansion resulting in asset inflation followed by contraction and asset deflation. Central banks have a confused role, has changed over time. Stated purpose between countries US vs UK isn't consistent. Efficient market hypothesis would suggest central bank shouldn't exist. Minksy school suggests that central bank can play a role to stabalize. Fantastic simplified history of money and banking. Central banks as lender of last resort, presence prevents run on a bank but encourages risky lending. Gold standard doesn't help. Awesome example of how a simple stock transaction can result in a huge significant increase in credit driving asset inflation and yet more credit. Self-reinforcing asset-debt cycles. Central bank should help managed these cycles and dampen them. Credit creation also boosts profits further promoting asset inflation (and thus more credit creation). An excellent simplified example: Company A who makes consumer goods and Company B who supplies all the inputs to A. Consumer savings can depress revenues and therefore wages of both companies similarly borrowing can create a temporary windfall. Continually low savings rate in the US due to reliance on dropping the interest rate whenever we have a slowdown. Bubbles don't require irrational behavior. Need to look at if credit expansion is the underlying cause. Credit expansion and contraction causing increasing instability seems similar to the "governor" problem solved by Maxwell's. He worked out that to keep a shaft rotating at a nearly constant speed you needed to make very minor adjustments to reduce oscillations a bit at a time. Suggests a similar approach by the central bank. Quantitative risk controls are based on demonstrably flawed models, they give us false confidence. Suggests Fed should stop worrying about consumer price targeting (chasing the wrong variable). Best solution to current crisis? Inflate our way out, hurts the prudent savers and helps risk taking borrowers.